Click here to like or share this web page to facebook - spread the word to help save koalas! Koala Gardens - a place of healing for the land and the spirit. When we found this property we fell instantly in love - but as I look back now I see how barren it was. Yes there were mature primary food trees, but no true native habitat to be found! These photos were taken around the time we were purchasing the property in 2010. 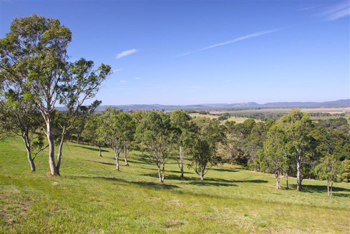 In 2011 Lismore City Council were successful in gaining some government funding and offered to all residents in koala habitat areas the opportunity to plant food trees. We decided that we would apply for funding to plant 400 tree in the area picture in the two photos above. 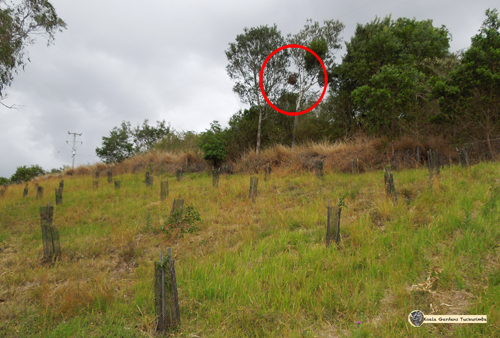 These 2 photos are the same area from a lower angle on the left and from the top boundary of the property on the right. 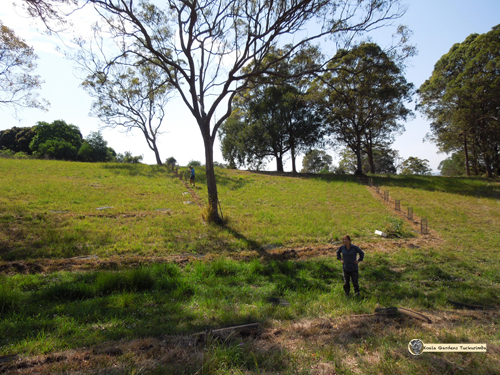 The photo on the right here shows David de Nardi from Roots Down Conservation Contractors working on some of the very first trees planted here. David has remained the lead professional regenerator on the property and his expertise has been invaluable over the years. 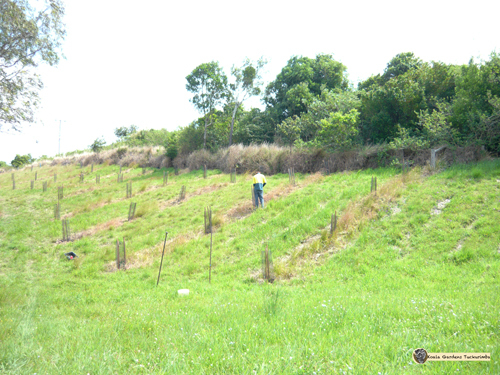 On the left is the lower area just before planting work began. 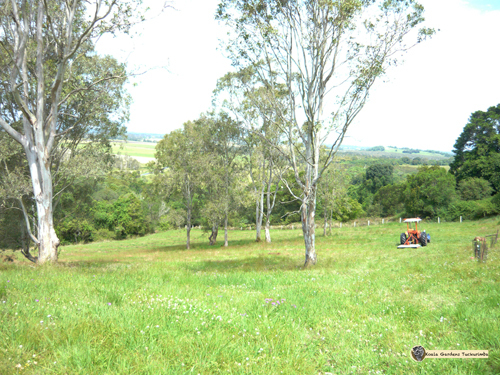 Below left is the same area with young trees planted. Below is the lower corner of this plantation area. 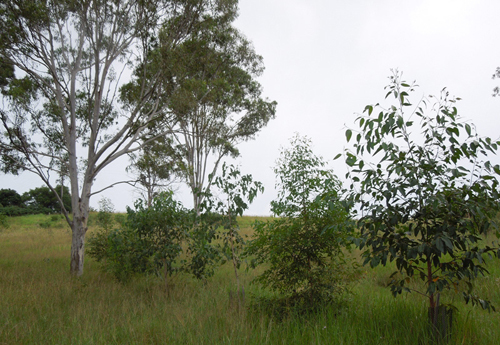 The trees planted are all native and a mix of primary and secondary koala food trees. 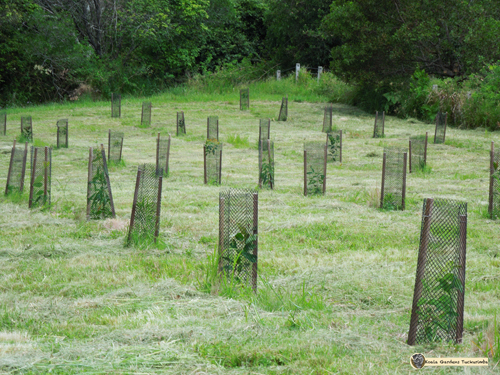 In 2012 there was a further round of funding and we were successful in applying to have a further 300 trees planted. 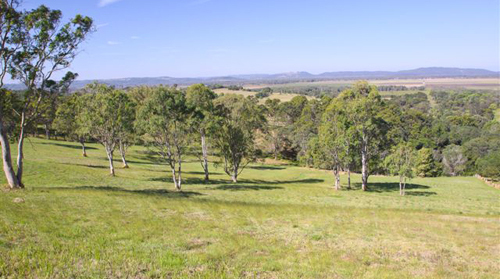 This time instead of a block of trees we felt it would benefit the koalas if we planted winding rows of trees through the property linking up the large mature trees that were isolated from each other. 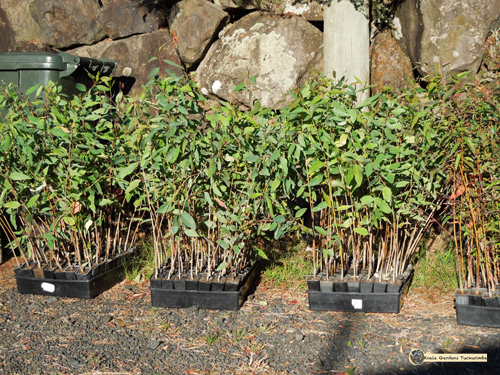 Friends of the Koala grew the seedlings for the project and so more trays of beautiful, healthy young koala food trees arrived. You can clearly see the lines of trees winding between mature trees here going in all directions. Work on the day of planting was fast as preparation was completed in advance and we worked as a production line team. Koala Gardens is situation inside a naturally occurring koala corridor, so even before the regeneration work was started, there were already koalas being spotted here such as you can see in the photo on the left. I was not daily spotting however in 2012 and did not know how to positively identify koalas. I also did not have a very good quality camera with efficient zoom so most koala photos from this far back are vague round shapes in the distance. 2013 was a very hard year at Koala Gardens as my husband Chris became obviously unwell and had to withdraw from activities of maintaining the property a little more every month. There are very few photos from this year due to this illness. When I did see a koala I would take photos, but I obviously had not yet learned the art of using nose pattern recognition to identify them! I would dearly love to know which of the colony koalas this might be, but I have to be content simply to document that there were koalas already on the property as it falls within a natural koala corridor. My amazing husband Chris was taken from me by MND in 2014 (also known as ALS in some countries). After spending a year caring for him as the disease progressed, I had to just leave the property to 'fend for itself'. 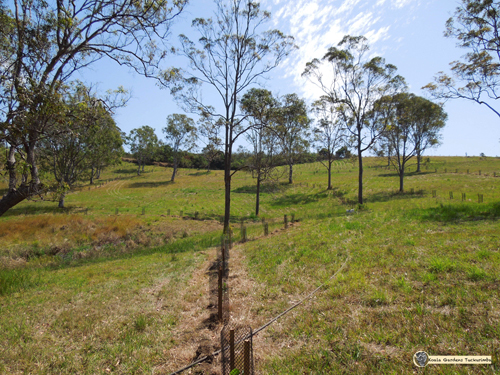 Incredibly, when I went for a walk on the property a few months after Chris died, I discovered that around 2000 primary koala food trees had self sown and the native grasses had taken over, and nature had been hard at work healing the land. At the time I first discovered the wonders of how mother nature was putting everything to rights, I was not even sure if these were the right koala food tree natives or maybe they were just rubbish, but I had a sneaking suspicion. The more I walked through the property, the greater grew my amazement. Seedlings ranged from just a handful of cm high such as pictured above, to fifty or so cm high such as on the left, and even some that were already around a metre in height such as below. 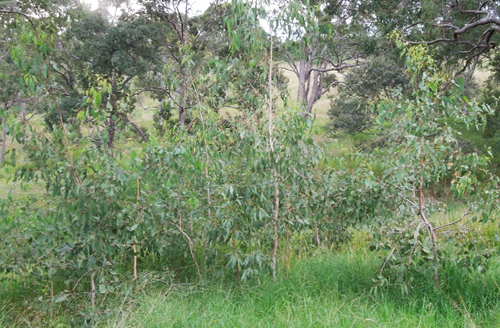 This patch, predominantly forest red gum has remained my favourite area of self sown trees on the entire property. I felt as though some magic of mother nature were at work, and still feel that strongly through areas such as this on the property today. This has been an amazing healing journey for me, as I learned to 'let go' and work with nature to provide native habitat for the koalas who are struggling so hard to find enough food in safe places. 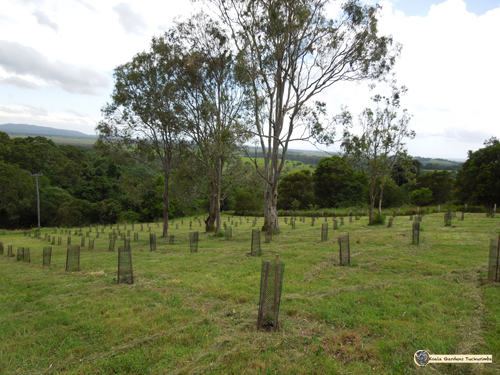 The trees planted in 2011 and 2012 were also growing on well. I began to investigate the changes on the property and adjust to the huge change in my life through the loss of my husband. I brought in experts from Friends of the Koala and professional regenerators, and a totally new appreciation of nature and approach to the property began to form. 2015 saw a real growth explosion or at least it seemed that way to as I watched trees around one to two metres tall seem to double in height. The trunks of these trees while still having their sapling appearance began to thicken from the size of twigs to 5cm or so. In just a year you can see the amount of growth pictured below right of my favourite area of self sown trees that was pictured earlier. Already there were signs of dense forest growth beginning. 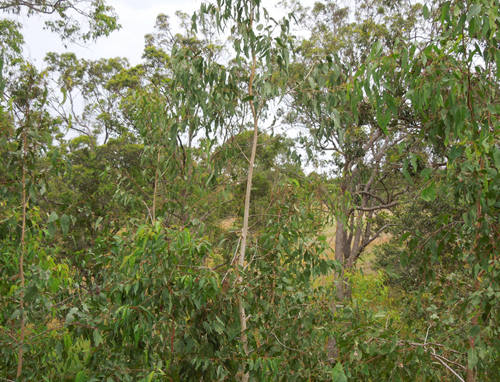 Above is part of the 2011 plantation, now four years old and most trees around three metres tall and displaying dense rich foliage. 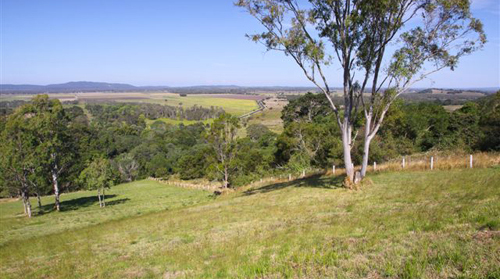 Landcare funding was approved for a regeneration project. This project cemented the commitment of the property to habitat regeneration and save my life as I fought for some meaning after the death of Chris. And as the year drew to a close the self sown trees were beginning to tower above me and I could feel the new vision taking shape. 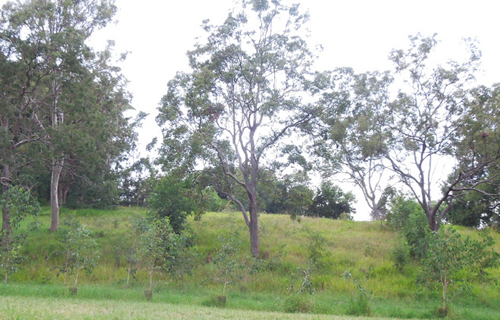 This is just the beginning of the story of Koala Gardens - a true haven for wildlife, body, mind and spirit.